How do I book KSP for a portrait session? The number of images will depend on the type of session, and the cooperation of all subjects involved. A typical full session will produce at least 25 images. All images are viewed in-person with me at an Ordering Session, where you will view your images for the first time via slideshow. Our Ordering Session will be at my Mount Clemens-based studio where you’ll see in-person my selection of products available for purchase. Can our friends and family view our images online and order prints? Yes, they can! After our Proofing Session, we can upload your images to an online gallery, where you will have first access to them. When you are ready to share your images, you can share directly from the online gallery or you can forward our email with directions and passwords. Do we get the copyright to our photos? Digital Images will be able to use for personal printing and online (i.e. – Facebook, Instagram, Twitter or a personal blog). All images are the property of Kateri Shue Photography. When using any of the images online you must place credit under every photo: Kateri Shue Photography with a link to my site: www.katerishue.com. You will receive a print release and some recommendations for where and how to print. 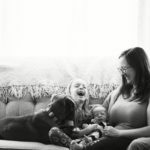 When is the best time to do maternity and newborn pictures? What is your turnaround time for my images? 2 to 3 weeks for the ordering session and digital files, after that 4-6 weeks for final products. What kind of information would you like? To get detailed portrait information, please call or email. 586-745-0646 | info@katerishue.com If you have general questions, check out the blog, then contact me!